There are four species of kangaroo, the Red, Antilopine, Eastern Grey and Western Grey Kangaroo. Red Kangaroos are the largest marsupial and can grow up to 2 metres. They can reach a top speed of over 65km/h – out-pacing a top racehorse. In one leap they can jump 3m high and 7.6m long. On land kangaroos only ever move their hind legs together, however in water they kick each leg independently to swim. Kangaroos are the only large animal to use hopping as their primary method of locomotion. Hopping is a fast and energy efficient means of travelling which allows them to cover large distances in habitats where there is little food and water available. 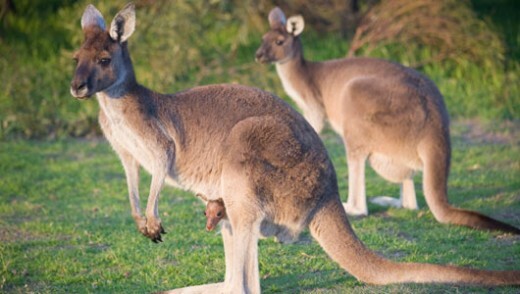 Young kangaroos (joeys) will sometimes jump head first into their mother’s pouch when frightened. Kangaroos have excellent hearing, and like some other animals are able to move their ears in different directions without moving the rest of their head. Kangaroos are social animals which stay in groups of at least 3 or 4 individuals. Some groups can comprise of as many as 100 individuals. There are more kangaroos than humans in Australia. They are the national symbol of Australia and appear on postage stamps, coins, and aeroplanes. Range: Endemic to Australia, some species also found in New Guinea, Tazmania, New Zealand and Hawaii.